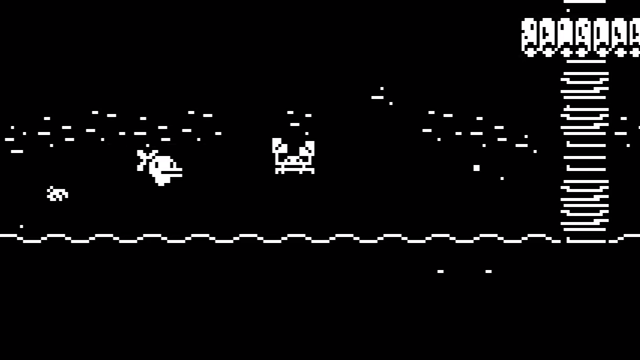 Minit was developed by several known factors among the peeps of gaming: Kitty Calis (Action Henk, Horizon Zero Dawn), Vlambeer-ian Jan Willem Nijman, musician Jukio/Kuabee (Luftrausers, Nuclear Throne, Bleed 2), and Dominik Johann (Dr. Langeskov, The Tiger, and The Terribly Cursed Emerald), and it was published by Devolver Digital, a studio with a pretty solid track record when it comes to choosing indie games for publication. The game is an action-adventure with limited visuals (I'm counting about 2 colors here) starring a vaguely ducklike fellow who begins his adventure after finding a sword on the beach. Unfortunately, the sword is cursed, and picking it up gives our hero only 60 seconds to live. However, upon death, he wakes up back at home, but he still has the sword and only a minute to live. The entire game takes place in 60-second intervals with the player making a bit more progress each time, earning new abilities along the way as he speaks with NPC's, slashes critters, and uncovers a nefarious plot. Minit is now available for PC, Mac, and Linux via Steam, GOG, and Itch.io, PS4 via PSN, and Xbox One via Microsoft Store. Check our coverage here.